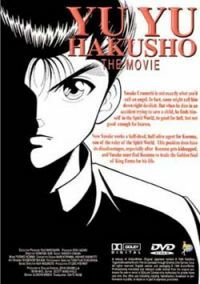 Yu Yu Hakusho the movie: Yusuke Urameshi is not exactly what you'd call an angel. In fact, some might call him down right devilish. But when he dies in an accident trying to save a child, he finds himself in the Spirit World, too good for hell, but not good enough for heaven. Now Yusuke works as a half-dead, half-alive agent for Koenma, son of the ruler of the Spirit World. This position does have its disadvantages, especially after Koenma gets kidnapped, and Yusuke must find Koenma to trade the Golden Seal of King Enma for his life. Ninku the movie: They have the reputation of being the top martial arts team in the world. They have combat techniques which can control the very elements. They have an understanding of human motivations and a capacity for withstanding humiliation beyond that of any normal person. They have a small penguin. They are the Ninku, full of martial prowess, low on brain power, and totally devoid of the respect they deserve.